What are the considerable benefits when using a Business Email plan instead of a free mail? 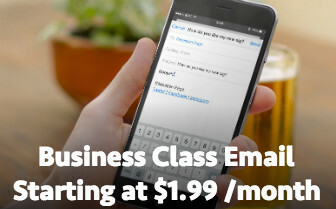 Many of us are using some form of free email service (such as Google Gmail or Yahoo) for our personal needs, although any company as well as a small business, can benefit much more from a business email service as it offers higher range of flexibility in management and sharing data between the co-workers, everywhere and anywhere. The email address that is hosted on your business website will provide your business communication with the best performance and functionality. With every email you send, you are able to communicate your company name and website domain name to your suppliers, distributors, partners and customers, so forth establishing your business identity and brand. Indeed it is a form of free marketing that does not add additional cost. How important is that your emails are a virus and spam free? Security and safety of your business correspondence are at a much higher level, with state of the art anti-virus, phishing and spam protection removing any email threats, so you will receive only the email you want. Any time you get stuck you will be able to contact expert staff that is trained in email problem resolving. Accessing your emails on the go! Being on the go will not change your email experience, as you will be able to stay in touch no matter if you are using a smartphone or favorite tablet. Alternatively, intuitive Web Interface can be used to access all your email from any internet browser, again anywhere and anytime. Desktop email client software such as Outlook or Mac Mail can be also used if preferred, so the users that are accustomed to such email experience will not be hindered. With everything said, depending on the size of the company, appropriate email hosting plan can be chosen. Personal plan features are ideal for hosting one mail at your personal website with ample 1GB storage space. A small company will benefit more from a Business plan, enabling users to quicksort messages with user-defined categories (example: sales@ or support@). A higher level of user performance is achieved through additional features such as 5 email addresses hosted, increased storage space of 5GB, a full-featured web interface for mobile and desktop access, basic mobile access and free integrated Group Calendar and Online Storage. The Unlimited Business plan is the ultimate solution with most responsive communication between devices connected to your email hosting, so they will automatically and quickly share changes done on any device. With all the previous plan features included, your 5 email addresses will have unlimited storage, fully synchronized emails on both mobile and desktop through IMAP, free Integrated Calendar and Online Storage (1st year), and with all this, your workers will be enabled for a better online productivity. With region-based servers, your emails will load quick, secured by a 256-bit encryption, with enabled POP3 and text mail service. All plans include FREE services of Calendar, Online Storage, Webmail (including access from PDA/handheld or mobile iPhone®, Blackberry® and Android® devices). Having all that in mind, there is no reason not to get Business Email hosting for your company as all the features and benefits will boost productivity within any company and provide value return.